A few months ago, a fellow Orion owner asked if I would recalculate the new treble shelving filter in version 3.2 to increase the treble level a bit. (See the trace labeled “Version 2” in the last graph on this page.) After upgrading his Orion crossover to version 3.2, he found the treble somewhat lacking. A SPICE modeling exercise showed that within limits, small changes to R400 changed the depth of the treble shelf above 10kHz without significantly altering the response below about 1.5kHz. 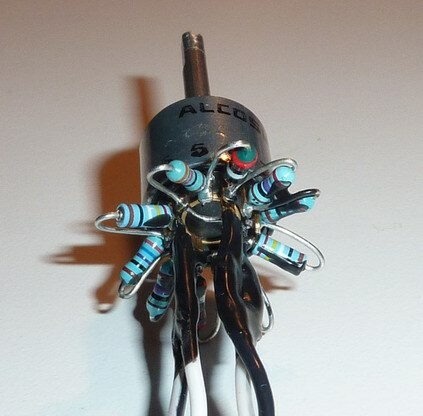 I suggested that he add a 1k resistor in series with R400 to increase the treble by 0.4db. He found that this relative boost in treble added openness in the harmonics and made the sound stage appear deeper with more air. A friend of his concurred that 3.2 sounded better this way. I decided to listen to variations to the treble shelf filter in my own system. I found the 0.4db boost to be a big help at low listening levels, but it was too energetic for me at louder levels. I installed a 5k pot in series with R400 and played. Reducing the boost to 0.3db seemed about right so I listened to it this way for some time. Most of my more important recordings sounded more like they did prior to revision 3, but unfamiliar material was often too bright and tiring. Ultimately, I decided to turn this filter into a tone control since its utility changes from recording to recording. 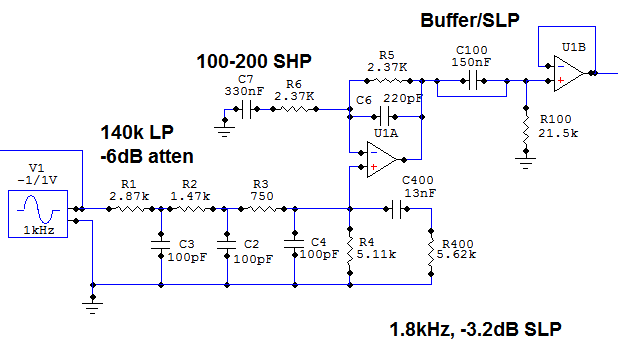 A 6 position 2 deck switch now provides from 0 to 0.5db of treble boost (relative to the -3.2db shelf) in steps of 0.1db. It is turned off most of the time, but sometimes it makes a dull, muffled, or lifeless recording much more enjoyable to listen to. The shelving filter is formed by the series RC network, R400 and C400, added parallel to R4. Without this network, the resistors R1-R4 form a voltage divider that drops the input level to U1A by half. The new RC network causes the impedance of the bottom half of the divider (R4 in parallel with R400+C400) to change with frequency. The resulting filter is a 1.8kHz, -3.2db shelving low pass filter. The following graph shows the response changes at the input to U1A when R400 is changed from 5.62k to 6.34k. Adding 700 ohms changes the response by +0.3dB at 10kHz and 20kHz, and -0.03db at 700Hz compared to Orion 3.2. It is possible to make the new curve track the old even closer in the midrange by lowering C400 to 12.5nF but that’s a lot of bother for 0.03dB. This graph shows how changing R400 from 5.62k to 10.62k in 500 ohm steps changes the response. This is where the investigation started. Here are some of the level differences at 10kHz and 700Hz when R400 is increased. The level changes at 20kHz are almost identical to 10kHz until about 3kohms is reached. The response pivots around 1.5kHz or so, at least in this range of changes for R400. I replaced the 5k pot with a surplus six pole two deck rotary switch. The switch increases the treble above 10kHz by 0.1db per step. It’s connected so that between 0 and 5 resistors are added in series with R400. SPICE modeling showed that 249, 267, 287, 309, and 332 ohm resistors would give roughly equal 0.1db increases. The resistors could just as well have been around 300 ohms each. The switch is installed on the front panel of the preamp/crossover box. 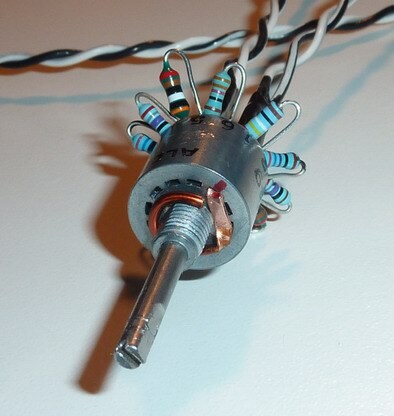 A three pole switch could be used to turn on an indicator LED when treble boost is active but this switch was at hand. This is a very impressive website. One can hear the call of Orion…. Craw! Craw! CRAW!!! Have you given any thought to different shelving for the front and rear tweeters? Keeping the front more nearly flat (if not flat) on axis, and implementing more rolloff on the rear to get the falling power response? I realize this is not an idea for the general ORION community, as it would take more than just some component swaps on the ASP, and that it might not be optimum for all recordings . . . but then, what is ? ? ? I suspect if the front response was flat (or flatter than 3.2) and the rear shelved more then the speakers would be much easier to locate. I’m happy with the disappearing trick that they pull off almost all the time. One explanation for the 3.2 shelf is that is makes the overly-bright sound coming from 30° off axis less bright, as if it was coming from directly ahead and then toned down by the HRTF. If the ambient sound field had even less highs from the reduced rear tweeter level, do you think it would make the recording locale seem like it was warmer or maybe even bigger? I don’t know how our brains would square that with off-center higher frequency sounds being more easily localized to the speakers. You could do what you suggest by manipulating the signal to the rear tweeter separate from the front, but it would have to be another active filter for a broad flat shelving boost. As you hinted at, that would require major surgery to the ASP, or adding another circuit board and rear tweeter output, which is also major surgery. Perhaps a passive resonant circuit could be wired in series between the rear tweeter and its amp but I don’t know how broad it could be made to act like a shelf. That would also be a step back to the old system of passive components between the amp and speaker driver, and at the worst end of the frequency spectrum for amp distortion. There might be neat effects from boosting the rear treble and the ambient treble without boosting the direct treble. Let me know if you discover anything. (hehehehe.) I think JimB was interested in driving front and back tweeters differently too, but for phase coherence reasons. >I suspect if the front response was flat (or flatter than 3.2) and the rear shelved more then the speakers would be much easier to locate. I don’t see why that would be . . . they weren’t “easy to locate” *before* the “+” revision . . .
> If the ambient sound field had even less highs from the reduced rear tweeter level, do you think it would make the recording locale seem like it was warmer or maybe even bigger? It depends on the recording, and what we’re “compensating” for. If the rolloff is mostly compensating for the overly bright image that is a result of close microphone placement (as I’ve speculated on the “user group” board) then the front tweeter should be rolled off (unless you *want* the “close to the band” sound). That’s the problem, the variation in recordings (and, of course, the variation in listening rooms). And the “ambient field” in the listening room is driven by *both* tweeters, so it can be changed by adjusting either (or both) . . . the question is whether one (always) wants to roll off the *direct* sound. >You could do what you suggest by manipulating the signal to the rear tweeter separate from the front, but it would have to be another active filter for a broad flat shelving boost. Which is why it couldn’t be implemented as an “rev” even if it were determined to be desirable. There are constraints imposed by the existing design . . .
> I think JimB was interested in driving front and back tweeters differently too, but for phase coherence reasons. Of course the rear tweeter *should* have a different delay (for acoustic offset) from the front, but that would also effect whatever little dipole cancellation exists between the two, and require a separate tweeter channel that’s not implemented on the current ASP board. Compromises, compromises . . . I purchased my Orion kit back in 2003. So my crossover is nine years old now. I have updated my Orion speakers to include the rear facing tweeter but I have not done anything to the crossover. I am an optical scientist and I know very little about electronics. What are your conclusions about the Treble Shelf Filter? I do not see any ‘conclusions’. Is the wiring diagram and pot something people should install or not? Can you draw some conclusions for the lay person?